LFA returns to the North Star State in September, looking to crown a new Middleweight champion. 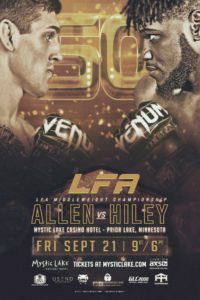 In the main event “All In” Brendan Allen (9-3) faces “The Amazing” Tim Hiley (7-0) for the vacant LFA Middleweight title. 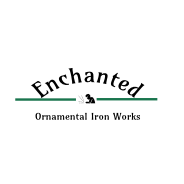 A title that was vacated by champion Anthony Hernandez & interim champion Ian Henirsch after they both earned UFC contract during the 2018 season of Dana White’s Tuesday Night Contender Series. 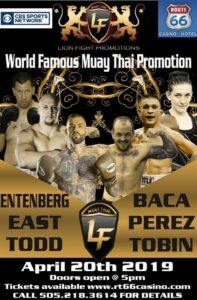 LFA 50 is set for September 21 at the Mystic Lake Casino Hotel in Prior Lake, Minnesota. Allen will be fight for the belt for the 3rd time. Allen earned his first shot with a TKO of Jon Kirk, but fell short losing a decision to Eryk Anders. The 2nd shot was earned after submitting Chris Harris, but Allen against came up short, losing a decision to Anthony Hernandez. Now coming off his 4th career knock out victory, stopping Larry Crowe in just over 2-minutes at LFA 43. The 22 year old, Louisiana native, spends time at Roufsport Academy and has won all his fight by stoppage. Hiley is a 29 year old, from Milwaukee, Wisonsin, training down the road from Allen at Pura Vida BJJ/MMA. Hiley has 4 finishes, 2 knockouts, & 2 submissions. The 29 year old, is 2-0 in LFA having defeated Willie Whitehead by TKO at LFA 34 & beating Tyler Vogel by unanimous decision at LFA 41.